Before this version, when the user wanted to customize some aspect of the rasterizer, blending or the depth states, we needed to create by code a new Layer class, registering it manually and then acceding it by its type. And you needed to implement the SetDevice and RestoreDevice methods, changint the RenderState structure. Initially we just wanted to integrated them into the Visual Editor, but then we realised that we weren’t allowing the users to use the full potential of the modern graphical cards, so we redesigned it. 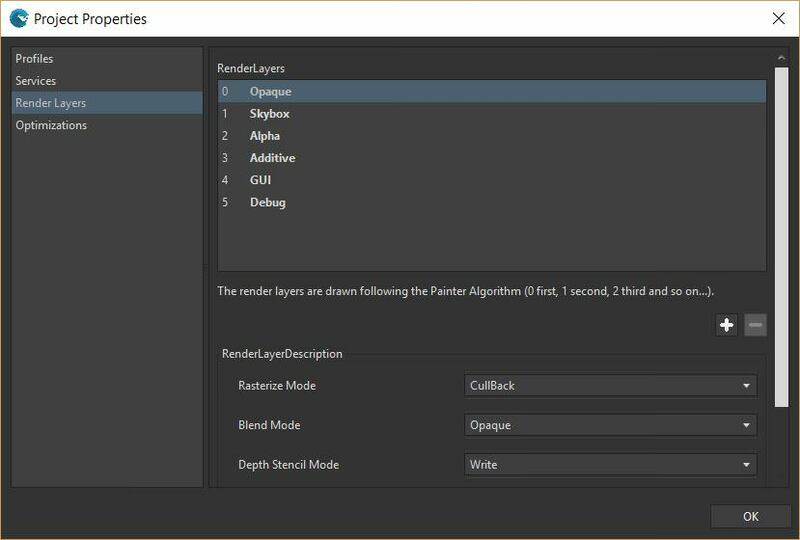 So the RenderLayer concept was born, a Visual Editor friendly specification of how the geometry and shaders are presented into the final frame. Our most important goal was to keep the simplicity of the previous implementation but adding the full potential of the modern graphic cards.